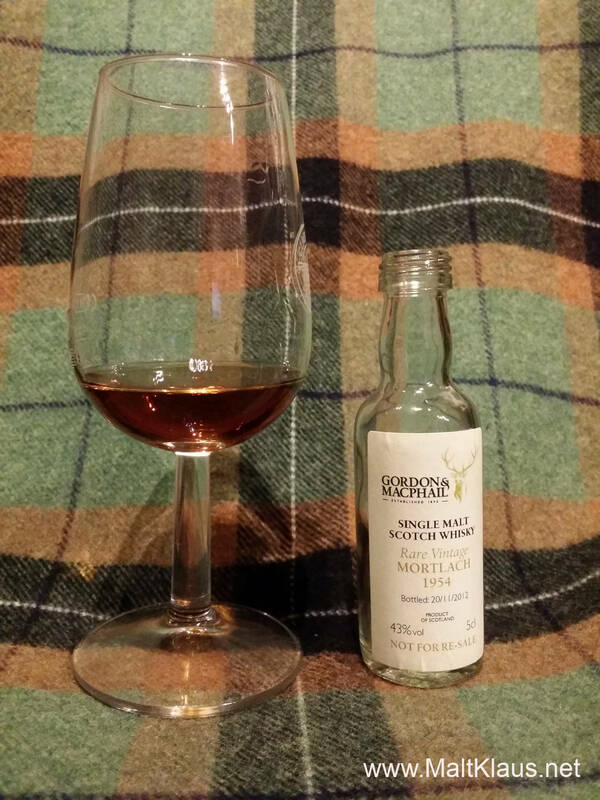 Let’s review the oldest whisky in the house – 58-year-old Mortlach, to be exact… just because it’s Christmas! The nose starts out surprisingly restrained. Not an over-oaked dram at all, as I initially feared. Delicate even, but what a nose! Lots going on in the glass! A myriad of warm, sweet, dried fruits. Seriously! An abundance of dried plums, cherries, figs and a sneaky date as well. But oh so mellow and as elegant as dried fruits can be! Of course we’ve also got spices. But mellowed, gentle spices, no harshness at all. Cloves, a cinnamon stick, bay leaves and allspice. And herbs. Wormwood, perhaps? But that’s not all, of course. The fruits and spices are accompanied by cherry-flavoured pipe tobacco with black cavendish, the leather jacket of an orchard worker, an bee-keeper’s oak cabinet and a slice of chocolate fruit cake. Dense, interwoven, layered, “aged” and still very elegant. What a nose! I really hope the palate will be the same!Mmmmhhhh… interesting – slightly lighter than expected, on the dry side and teeth-coating!. Old oak does dominate the initial impression with dry and pleasantly bitter aromas, the dried fruits have moved into the background. The second sip reveals more fruits on a bed of waxed and polished oak boards – dried cherries, plums and raisins (just the aromas, not much of the fruity sweetness!). Black cavendish pipe tobacco is back, so are the spices – cloves, allspice and some wormwood. The only thing I’m missing a bit is sweetness, it is on the dry side. Still very good, layered and well-aged, it just doesn’t quite follow through on what the nose promised (but on a very high level!). The long finish is rich upon swallowing, a slight alcoholic tingle. Very dry, with polished oak floorboards, wax, dried fruits (again, just the flavour components), spices and herbs (cloves, wormwood, allspice). Fading away very consistently, leaving a waxy, (not too) oaky aftertaste. Ha! Now there’s a surprise! This started out very dense and fruity on the nose, with a much more spicy, dry, waxy, oaky palate and finish. Not over-oaked at all, but you can tell this has been aged for a few decades. Very good stuff, especially if you like your drams on the dry side! Price? If you need to ask, you can’t afford it anyway and whiskies like these are a league of their own, you really do pay for exclusivity and rarity. That being said, G&M is one of the more reasonably priced bottlers of old whisky! 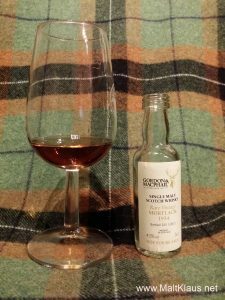 Thanks to my malt mate Jo for sending me half of her sample she got by G&M for a tweet tasting!